Google+ is one of the Google app that allow you to share articles, video, photo and also connect with millions of user across the globe. Most gmail account are linked to Google+ account to bring about easy connection with friends and family, you have the platform to follow any users or fans of your choice at the same give room for private chatting via hangout, hangout is another app from Google and it's so good to work with. Hangout allow you to chat, make video and voice call via the app and no additional charge attached, as soon as you have your google mail that gmail then you have access using hangout app which is made available in store for free. Earlier this week it was announced that their will be some added features to previous Google+ app which is finally here compare to the former interface, these doesn't require any update for apk users but rather switch on the current one. Based on the comparison and the tips got from different source , it seems these will be a good interface for everyone. 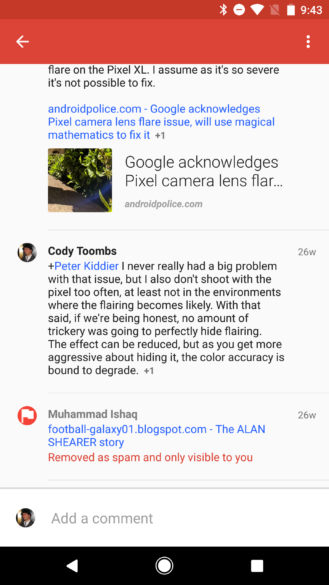 Grey-spammed comments are now viewable by post authors. Google+ is okay and it's available in Apple and Android store, to get that launch your play store or app store, search for Google+ and install as soon as it load or Click here to download directly only for Android user.